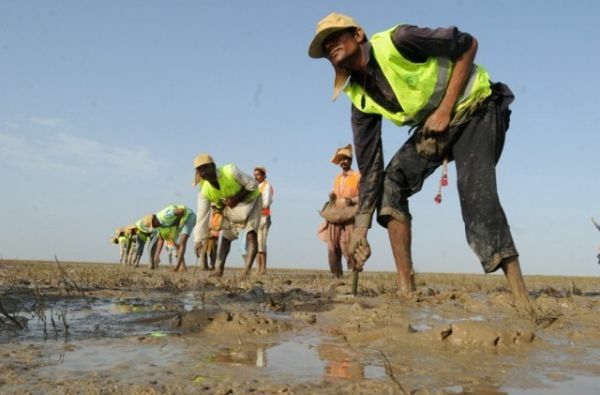 KETI BUNDER, Sindh: “The Sindh Forest Department has set a Guinness World Record for planting a maximum number of mangroves saplings at Keti Bunder” on Saturday (June 22), informed the Additional Secretary Sindh Forest and Wildlife Department, Mr. Aijaz Ahmed Nizamani at a press conference held here, in Keti Bunder, a coastal town in Sindh. He was accompanied by Mr. Mahmood Akhtar Cheema, Country Representative, IUCN Pakistan; Mr. Riaz Ahmed Waggan, Chief Conservator of Forests and Mr. Muhammad Umer Memon, Project Director Sindh Coastal Community Development Project (SCCDP). Two independent adjudicators for the Guinness World Records event, Mr. Rafi-ul-Haq and Dr. Shaukat Hayat Khan also joined them, along with Mr. Tahir Qureshi, Coastal Ecosystem Expert, IUCN Pakistan. The announcement was made, shortly after 300 coastal community volunteers had planted 8,47,257 saplings, breaking an earlier record of 6,11,000 saplings planted by India in 2010. While congratulating the nation, he thanked the forest department employees, coastal community volunteers and the coastal experts for their tireless efforts in achieving this goal. He also informed the media that the Asian Development Bank has announced Rs.5,000 as a special reward for each of the volunteer. ADB has funded a 5-year long Sindh Coastal Community Development Project in the area in partnership with the Sindh Forest Department. A special shield was awarded to Mr. Tahir Qureshi for his exceptional conservation work in the Indus Delta over the last few years. While congratulating the efforts of the Sindh Forest Department, Mr. Mahmood Akhtar Cheema said that there have been competitions between Pakistan and Indian in sports but a competition in the field of environment is even healthier, as in the end it will only lead to healthy ecology in both the countries. This entry was posted in Afforestation, Global warming, Rivers, Saleem Shaikh, Sea level rise, Wetlands and tagged Global warming, land erosion, mangroves, sea intrusion, sea-level rise by saleemshaikh. Bookmark the permalink.